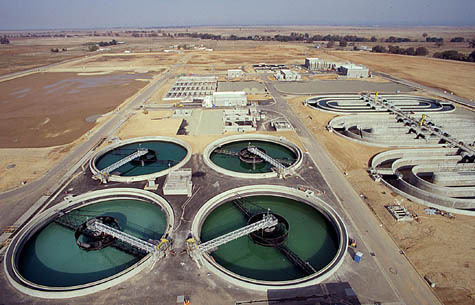 [Image: The wastewater treatment plant at Roseville, California, unrelated to the poem discussed below]. For nearly four years now, without access to a good library, I've been looking for a poem called "Staines Waterworks" by the English poet Peter Redgrove; it's impossible to Google and, though I knew I'd actually photocopied it for myself nearly a decade ago, I had apparently lost the photocopies. But, then, amidst the weird rolling peaks of recovery and amnesia that come with cleaning through your old books and papers in the family basement, I found a sheaf of old photocopies in a box about an hour ago – and inside it was "Staines Waterworks" by Peter Redgrove. The poem is incredible for a variety of reasons; but its most basic impulse is to describe the water purification plant at Staines, west London (the hometown of Ali G), as a kind of previously overlooked alchemical process. It is water "in its sixth and last purification" that "leaps from your taps like a fish," Redgrove writes. The poem is a stimulatingly odd collision of occult – many might say openly New Age – symbols and present-day civic infrastructure. In the process, it raises some amazing and fascinating questions of how we might more interestingly interpret the built structures surrounding us. Redgrove describes the movement of water through its various steps of industrial filtration, saying that it "reverberates... like some moon rolling / And thundering underneath [the] floors," passing through a "windowless hall of tides." It is a surrogate astronomy, surging through the replicant gravity of pumps and steel holding tanks. The processed river water is then decanted, surveilled by automata, and "treated by poison gas, / The verdant chlorine which does not kill it." Beyond life, it is pushed through "anthracite beds," where Water meets Earth in an engineered encounter between the elements. 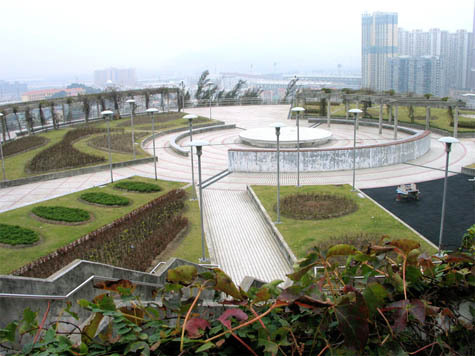 [Image: A wastewater treatment plant in Macao, via Wikimedia, unrelated to the poem discussed in this post]. Later, in what Redgrove might call its fourth purification, the water at Staines flows past an underground structure that resembles "a castle," complete with "turrets / And doors high enough for a mounted knight in armour / To rein in." Dials here are read "as though [they are] the castle library." Hair white and long in honourable service. Civic water-filtration takes on the air of a Druidic ritual, with bespoke costumes, arcane electrical equipment, and the dull roar of the inhuman echoing both above and below. Thames Water or, for that matter, Brita become strangely occult organizations obsessed with ritual actions and weird geometries, like something out of Aleister Crowley. It is sustainability by way of the B.P.R.D. Redgrove's poem – and I refer only to "Staines Waterworks" here, as I am not that familiar with his other work – shows the transformative power of description: give something an unexpected context and whole new, extraordinarily vibrant worlds can be created. This is more important, more lasting, and more interesting than much of what passes for architectural criticism today. Finally, the baptized liquid at Staines reaches a point of biological and chemical clarity, after which it is re-introduced to the city through a labyrinth of pipework that extends in wild curlicues, a machinic Thames beneath western London. Scalded, filtered, purified, made artificially natural and ready for drinking, it is water born again for future uses. "the transformative power of description...is more important, more lasting, and more interesting than much of what passes for architectural criticism today." Fantastic stuff. Redgrove contributed to the literary magazine Second Aeon in the early seventies as did Iain Sinclair when he was still writing poetry. The difference in their approach is telling. Iain Sinclair referred to the allotments which were demolished to make way for the Olympics as 'sites of unimproved imagination'. Redgrove looks at this piece of sewage infrastructure in a slightly different way. Except he finds the Staines site so emotive and rich that he cannot help but improve it with his imagination. Love it. Is Staines Waterworks what was Perry Oaks sewage works, now lost to Heathrow Terminal 5? You still can't read it in Google Books, I'm afraid. What I mean is that the full text of the poem appears to be impossible to find online; you can find references to the title, but not the full text. Wangi, I think it's still around, actually, but I could be wrong. Glad you guys like the poem! Does anyone know in which book the poem is published, or is ti possible to post the poem in the website? Anonymous, I've got the entire poem here, in a photocopy, but I'm wary of putting the whole text on my blog (as that would constitute unauthorized republication, I'm afraid). But the poem is from a book called My Father's Trapdoors, in case you find yourself in a library soon... Enjoy! The place of water in the imagination of cities is surely a vein to mine. The post after this one (Phantom Cities) likens the iPhone app to a dowsing rod, for instance, the metaphor doubtless arising (surfacing?) from the qualities of the element - fluid, penetrating, inanimate but quick, almost willful, spiritual, marking geology, evasive, bursting up from where history lies buried and disappearing again, and yet inherently linked to fiction, lacking appearance of its own, visible only by reflecting, distorted, its surroundings. How many times has London been imagined as Venice, Rome, Verona, and almost every time, somewhere there, the vector linking the two the Thames. One of the loveliest is gruesome sublime-fest Fall of Babylon by John Martin, at that very time also drawing up the very sober plans for a sewage system prefiguring Bazalgate's, that was to save it from at least some of its worst excesses. Can I include a link to a weird and wonderful site for its doctored photos in the tradition London as Venice: http://www.forgottenfutures.com/library/venice/venice.htm ? I'm delighted to find that this poem (Staines Waterworks) by my late husband Peter Redgrove is such a favourite - he and I were taken on a tour of Staines Waterworks thanks to my late father Jack Shuttle's contacts there - as a boy Dad worked briefly, before the war, in the office of the waterworks, and his brother Bert worked there all this life. Their father, my grandfather Shuttle, was a senior foreman with the workgangs there all his working life. We visited in a very cold and icy February, and I have strong memories of that day. People who might like to know more of Peter, with his love of the scientific, (both rational and occult) might be interested in the forthcoming biography of Peter (Cape, Random House 2012) now being written by Professor Neil Roberts, Emeritus Professor, University of Sheffield, UK. This will be accompanied by a separate volume of poems, a new Selected Poems of 500 pages. Staines Waterworks is indeed that ornate-ish building just before the Staines bypass, and yes indeed Staines is the Queen of Waters, all London's water comes from the many reservoirs in and encircling Staines. It is, I think, to the west of the old Perry Oaks works. Peter's poem is also to be found in his Selected Poems, Cape, 1999, and will be included in the big Selected due from Cape in 2012.